The Emerging Politics of (Re) making Cairo's Old Quarters examines postcolonial planning practices that aimed to modernise Cairo’s urban spaces. The author examines the expanding field of postcolonial urbanism by linking the state’s political ideologies and systems of governance with methods of spatial representations that aimed to transform the urban realm in Cairo. Adopting an interdisciplinary approach, the study draws on planning, history and politics to develop a distinctive account of postcolonial planning in Cairo following Egypt’s 1952 revolution. 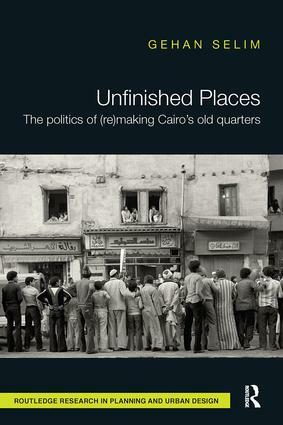 The book widely connects the ideological role of a different type of politicised urbanism practised during the days of Nasser, Sadat and Mubarak and the overarching policies, institutions and attitudes involved in the visions for (re) building a new nation in Egypt. By examining the notion of remaking urban spaces, the study interprets the ambitions and powers of state policies for improving the spatial qualities of Cairo’s old districts since the early 20th century. These acts are situated in their spatial, political and historical contexts of Cairo’s heterogeneous old quarters and urban spaces particularly the remaking of one of the city’s older quarts named Bulaq Abul Ela established during the Ottoman rule in the thirteenth century. It therefore writes, in a chronological sequence, a narrative through time and space connecting various layers of historical and contemporary political phases for remaking Bulaq. The endeavor is to explain this process from a spatial perspective in terms of the implications and consequences not only on places, but also on the people’s everyday practices. By deeply investigating the problems and consequences; the strengths and weaknesses; and the state’s reliability to achieve the remaking objectives, the book reveals evidence that shifting forms of governance had anchored planning practices into a narrow path of creativity and responsive planning. Gehan Selim is an architect and lecturer at Queen's University Belfast, UK. She holds a PhD in Architecture from the University of Sheffield, UK, and is a fellow of the Senator George J. Mitchell Institute for Global Peace, Security and Justice, UK.